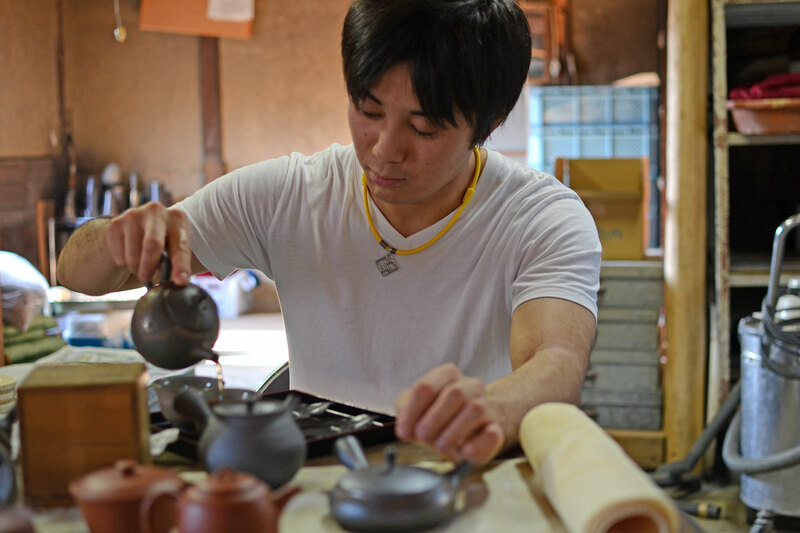 On an unusually warm November day in Japan, I visited Yamada Yutaro, a young rising star of kyusu teapot makers in the old pottery town of Tokoname. When Yamada-san graduated from college, he did not appear destined to be a potter as he went to work for a construction company. But he always wanted to make kyusu, so he heeded the advice of a colleague who said that he should follow his ambition sooner rather than later.Yamada-san quit his job after just one year and returned to school to study ceramics. Yamada-san grew up in Tokoname, which is a ceramics town south of the sprawling city of Nagoya. 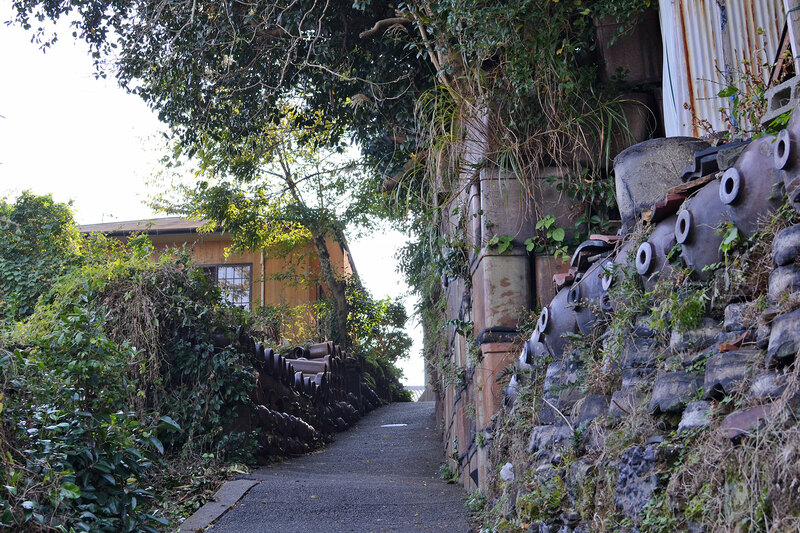 Tokoname is one of the six oldest pottery towns in Japan and dates back to the 12th Century. The town flourished during a big construction boom in the Meiji era as it became a supplier of ceramic drainpipes. A street in Tokoname lined with reused ceramic pipes and shochu bottles. 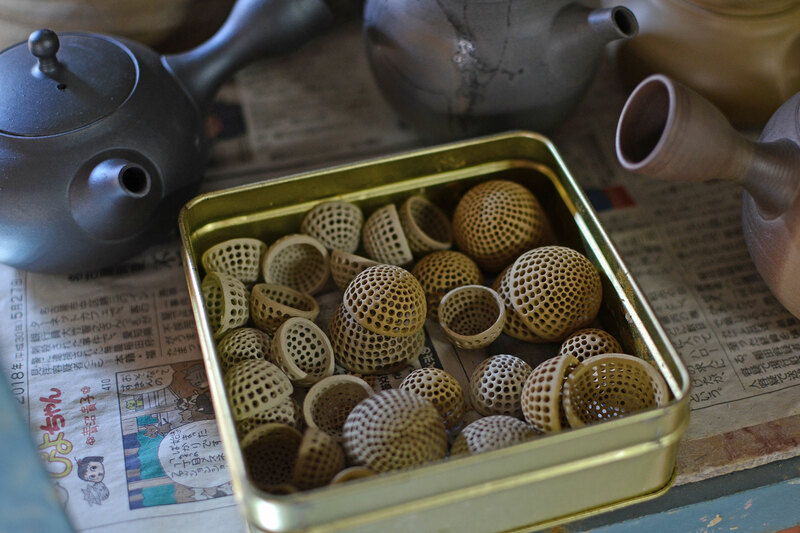 Tokoname was once the largest producer and supplier of these ceramic items in Japan. During the Showa era, Tokoname became widely known for its kyusu. When I was growing up, even in my humble house, we used kyusu from Tokoname to drink green tea because it was the brand to own! 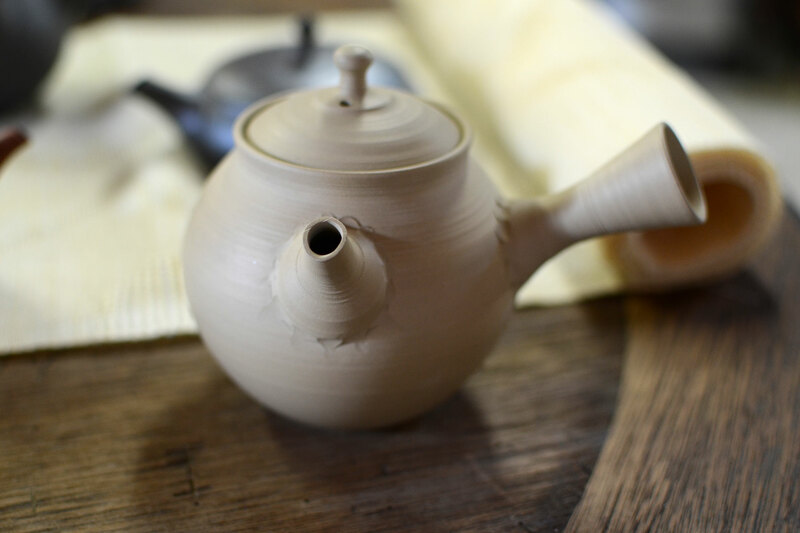 Kyusu making in Tokoname is believed to have started during the Edo period when a local potter called Inaba Shozaemon started creating teapots by referencing drawings of old teapots he found in a book. The fame of Tokoname Kyusu grew further when a Chinese Yixing potter called Jin Shiheng was invited in 1858 to teach red clay (Shudei) kyusu-making techniques to local Tokoname potters by Koie Houju, a prominent Tokoname potter and businessman who made his fortune in the drainpipe business. The studio of Yamada-san’s father stacked with ceramic planters. The Yamadas have been potters for three generations. Many families in Tokoname have been potters for generations. In the case of Yamada-san, he follows his father and grandfather into this profession. But unlike most Tokoname pottery families, the Yamadas are very individualistic and each generation has pursued different interests. Yamada-san’s grandfather made hibachi, while his father is focused on planters. Yamada-san himself is a kyusu maker. “I’m infatuated with kyusu, but my father says he has absolutely no interest in kyusu”, Yamada-san chuckles. But the son always keeps in mind what his father told him when he quit his office job to become a full-time potter, which was that it was not easy to make a living as a potter. 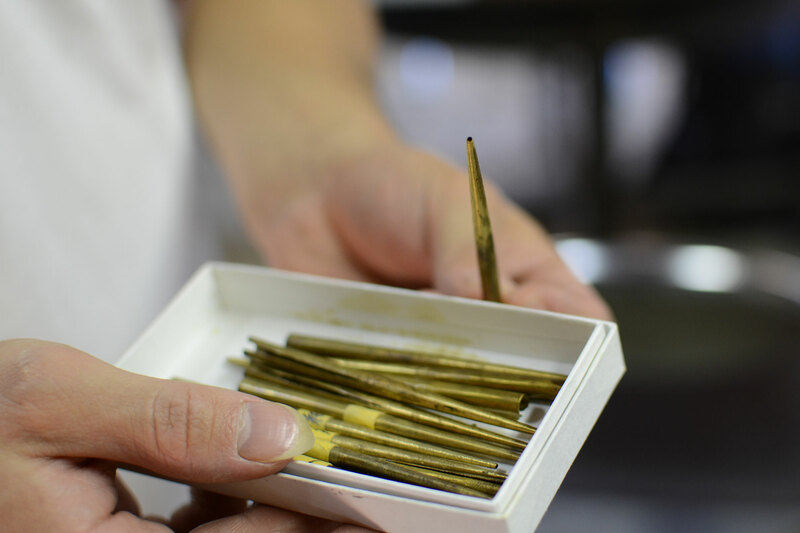 Kyusu making is a very delicate and exacting process with each step requiring the utmost precision. 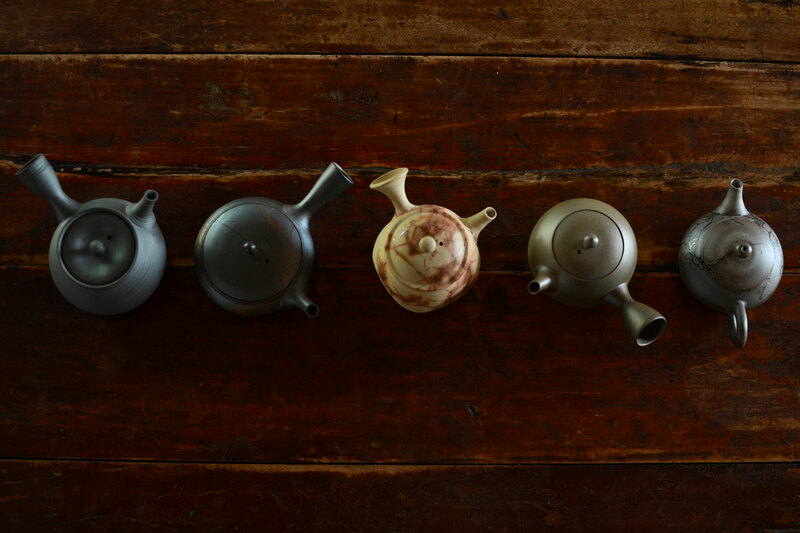 The body, lid, tea strainer, handle, and spout are all created separately and subsequently put together meticulously. 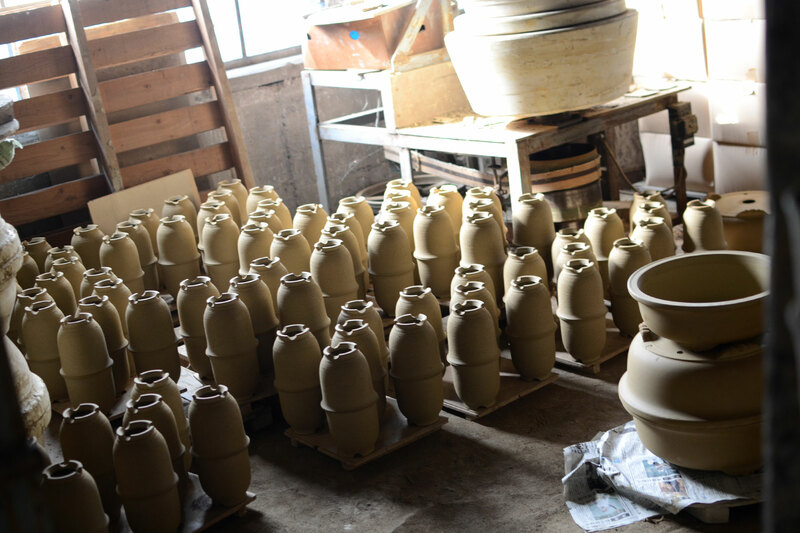 As kyusu making is so highly specialized, Yamada-san said that the general ceramics training taught in schools was not directly useful to him. The strainers that will be attached to the inside of the spout. 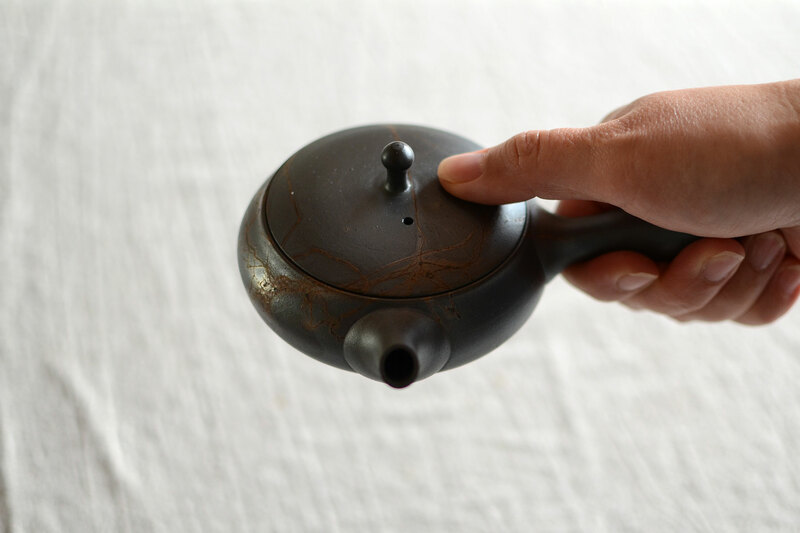 The holes are larger on the edge to allow for the last drop of tea to come out easily from the teapot. So after his school training, Yamada-san honed his skills by getting hands-on experience from expert local teapot makers like Murakoshi Fugetsu, who learned from Yamada Jyozan III who was designated as an important intangible cultural property (also known as a living national treasure) of Tokoname Kyusu by the Japanese government in 1998. Yamada-san also visits Yamamoto Hiromi, who he refers to as the “god of Kyusu” and is a renowned Banko pottery kyusu artist. Yamada-san holding his “family treasure” brass hole cutter used to make the strainer. The nail on his right thumb is used for making the knob on the lid. Kyusu greenware before high firing. The spout is attached slightly turned counter-clockwise, because the clay will pull back and the spout will turn clockwise during the firing. According to Yamada-san, a good kyusu is comfortable to hold, which means that it should be easily held by one hand without any part of the user’s hand touching the lower body of the kyusu as it can get quite hot. The kyusu should also have a spout that pours smoothly and does not dribble. The strainer should allow for the last drop of tea to come out of the pot easily. And finally, the wall of the kyusu should be very thin so that it is light and easily held with one hand. A hiragata kyusu by Yamada Yutaro. A good kyusu is lightweight and comfortable to hold with one hand. From clay preparation to firing, Yamada-san is tirelessly meticulous. It was so refreshing and infectious to see his fascination with the kyusu. “I think good work inherently embodies the passion and spirit of the maker, and I want to make such work,”, Yamada-san observes. Looking at his beautiful kyusu, I think he is already doing this extremely well.